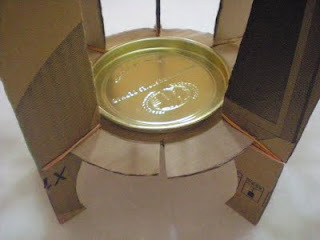 Creative Recyclers: Cardboard box? Great for lantern. Cardboard box? Great for lantern. 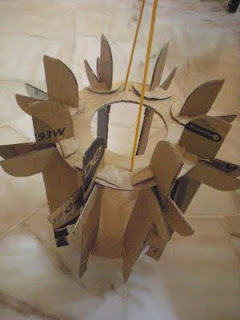 Would you like to make the lantern I created for my son this year? Go find a good pair of scissors, an empty cardboard box, 16 rubber bands and follow these steps. I used a box for packing a 17" monitor to create this lantern. If you would like to create templates for the lantern to keep for future reference, here is how each piece should look like. 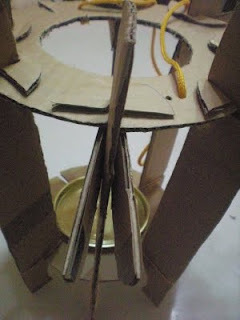 1) To draw the circles to form the top (1 pc) and base (1 pc) of the lantern, look for 2 plates with one about 3-4cm larger than the other in diameter. 2) Where there are straight lines marked around the circumference, cut slits through about 2-3cm towards the centre for both circles. 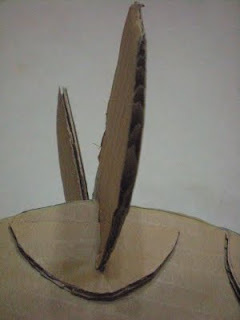 The width of each slits depends on the thickness of the cardboard. 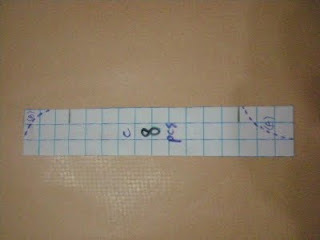 Here is a photo of a slit I made at the base. Note: You can see that I have included a cover from a biscuit tin to protect the base from being damaged by lighted candle and rubber bands to secure the panels to the base. 3) The slits will enable you to slot in panels "C" (8 pcs) to form the sides of the lantern. The length of my panels are based on the height of the box I used, which came up to about 41cm. The width of the panel is 6cm. 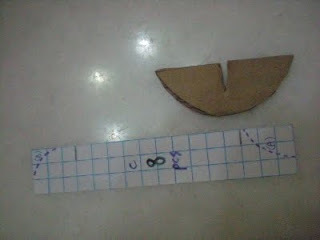 4) Once you have cut out 8 pieces of panel "C", cut along dotted line marked on the template to shape the panel. 5) At where you see straight lines, cut a slit of 1cm through at the top and bottom of each panel. 6) Do not discard the cut offs from the base of each panel. 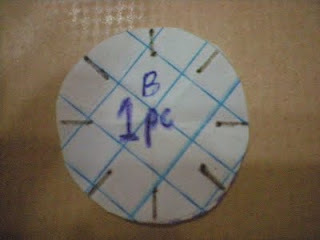 Shape the cut outs (8pcs) to form a semi circle before cutting a slit in the centre along the diameter as shown below. 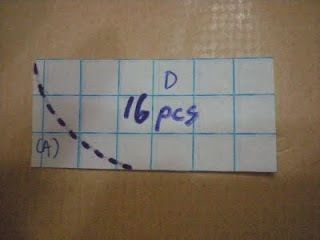 7) Now cut out "D" (16 pcs) to decorate the lantern. The length should be double the width of panels "C". 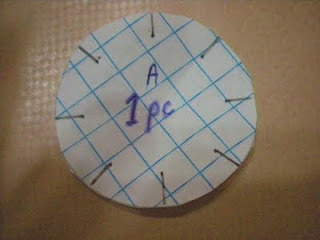 Mine came up to 12x4cm. Cut at dotted lines to shape them. Note: Two pieces of "D" will be required to decorate each panel. It will only be stapled to the panels, one on each side, after all panels have been inserted to the top and base of the lantern. 1) Get your 16 rubber bands ready. Secure two rubber bands to the base of each panel "C" as shown here. 2) Bottom to bottom, slot all panels to base, circle "B". The slits at "B" should sit between the "V" of the rubber bands which will hold each panel in place. 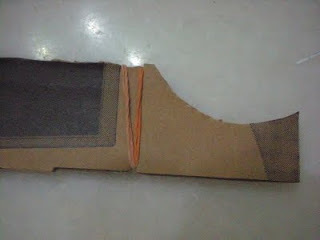 3) Slit to slit, top to the top, slot the panels to circle "A". 4) Staple "D" one and each side of panel "C", right below circle "A". Then push a semi cirlce into each panel as shown here. 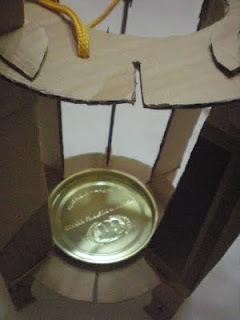 5) At the top of lantern, cut a smaller circle in its centre. Punched two holes opposite each other. Push a string through one hole then the other end to the other before tying knots at each end. I used a string that I removed from a paper bag I have. 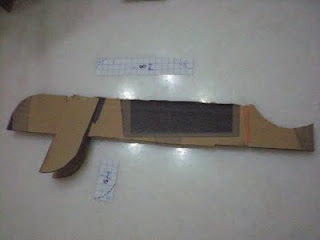 6) You can decorate it further by colouring it or sticking coloured papers on it. 7) Your lantern is ready. Just remove 1 panel to insert candle for a light up. 8) Push the panel back in place once candle is lighted. Enjoy. If you like this, check out the free tutorials for other lanterns that I have created.